These pizzas topped with homemade paneer, made from a2 milk, are perfect for a weekend supper. Making a simple cheese from milk is very very easy and means that if you cannot have regular cow’ milk you need not miss out on pizza. 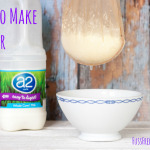 (Read more about a2 milk here). For an even speedier supper use ready made pizza bases and tomato sauce. I like to make a big batch of tomato sauce, then freeze in individual portions for use in pizza and pasta. 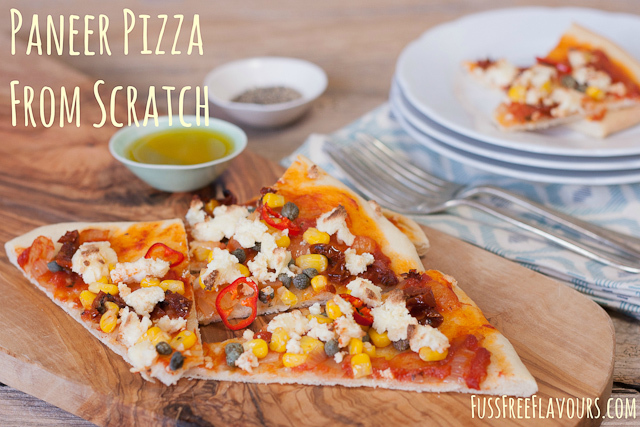 If you try this Paneer Topped Pizza From Scratch please tag #FussFreeFlavours on Instagram or Twitter. It is amazing for me when for me when you make one of my recipes and I really do love to see them. You can also share it on my Facebook page. Please pin this recipe to Pinterest too! Thanks for reading Fuss Free Flavours! Pour the milk and lemon juice into a saucepan, stir and heat to a simmer. The milk will curdle. Sterilise a jelly bag or muslin cloth by pouring a kettle of boiling water over it. Line a sieve with the bag or cloth. Strain the milk mixture through the cloth gathering the curds into a ball and leave to drip. Squeeze then wrap in a clean tea towel and place under a weighted chopping board. Unwrap and store in water in the fridge for 48 hours. a2 Milk contains lactose. Lactose is the sugar which is present in all milk, unless it is labelled ‘lactose free’. If you have been diagnosed with lactose intolerance by your doctor, a2 Milk will not resolve any digestion problems. If you have any questions about a2 milk and its suitability for you, you can contact their nutritionist, Melanie Bibby via this page. Please also consult your GP for advice if you are concerned about food allergies or intolerances.